Woke early because I had to get Rachel off to the doctor (although the new pills she got last night mean that she is in good spirits this morning). I walked both dogs and breakfasted in the farmhouse and was ready for Tom when he arrived about 9 a.m. 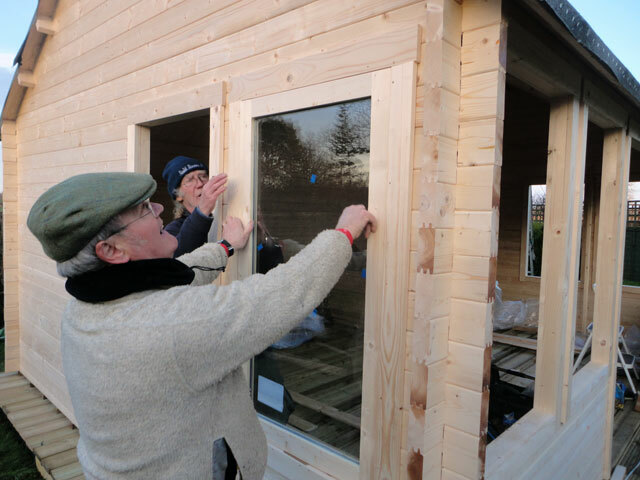 The task identified by him for today was to put the roof shingles on the summerhouse. However we weren’t quite sure how to do this so I was despatched to look up the maker’s instructions (rather than the summerhouse manufacturer’s instructions). 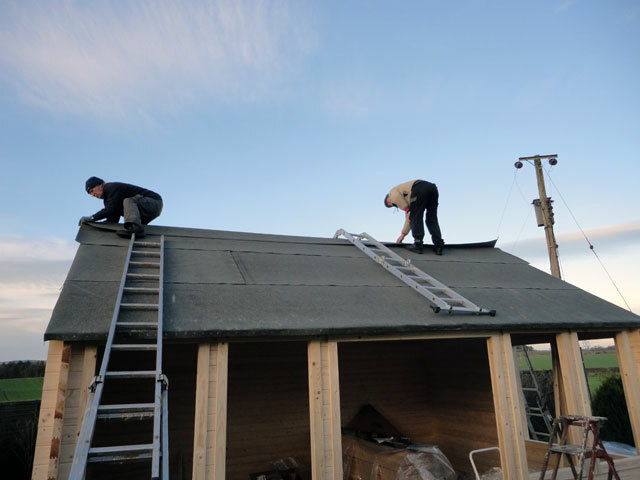 The first thing I discovered was that the shingle-maker felt that it was essential that shingles were fitted on a bed of mineral felt, something the summerhouse manufacturer did not think was necessary. So I went off to Pearson’s (who are now making record profits since my arrival in Duns) to buy thirty square metres of best mineral felt and some roofing nails. 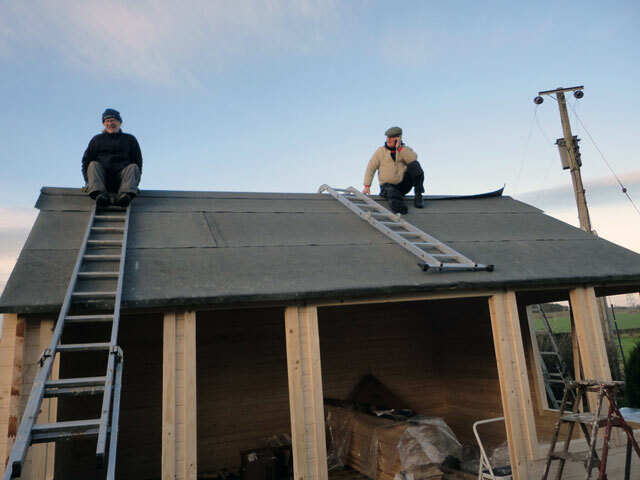 Soon we were hard at work installing the roofing felt and although we worked exceedingly hard it took most of the daylight hours – we did stop for coffee and a roll – and Tom and Digger did manage to fit two of the windows while I was left hammering in nails on the roof. We discovered that although the summerhouse has eight windows, we had only been sent ironmongery for two of them; so six will have to wait until the missing bits arrive. In fact Rachel ended up making no fewer than five separate journeys to Duns today – to visit the doctor, to take Mum to her hairdresser, to Pearson’s to buy another ten metres of roofing felt (yes, we miscalculated), to return a damaged roll of felt to Pearson’s and get a replacement, and to collect Mum from her hairdressing appointment. As darkness fell I came back into the Granary to get warm and was caught by a number of phone calls. Soon it was time for fish-pie and rice pudding (with pineapple) and afterwards a family discussion before returning to the Granary just in time to walk the dogs under a full moon before bed. And I have to report that today we lost the ashes. It has been a series in which almost everything went wrong which possibly could. Does this mean the end of England being one of the best teams in the world? Of course not. It is a setback but England have the players to bounce back and already Ben Stokes (of Durham, of course) has started to emerge as a player to watch for the future.